We flew in under a grey-blue ceiling to the most spectacular playground I have ever seen. On the Pika Glacier, rock buttresses rise like sharks’ teeth from the valley, their ridges separated by perfect ribbons of snow that plunge into the glacier below. Denali looms in the distance, so tall that it could easily be confused for a wall of clouds. Stepping out of the airplane, I felt I was in the throne room of gods. Overflowing beyond the horizon in every direction lay couloirs, spines, and faces soaked in golden evening light. “Getting Alaska’d” is a term I learned to embrace this season. It’s a catch-all, useful in describing any situation in which either an objective itself or the outcome of attempting it is far more extreme than anticipated. 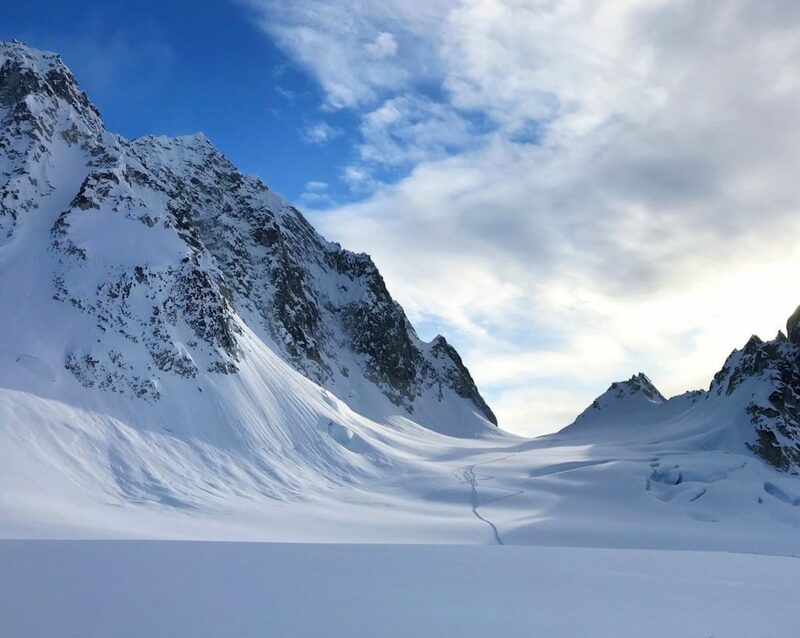 Before I went to the Alaska Range, I had a limited concept of what the idea of a trip “not going as planned” truly meant. What could possibly go wrong in seven days? Pika Party People unloading onto the glacier. Jeff unzipped the window of our kitchen tent and surveyed camp. It was day two of our trip and snowing hard, hard enough that we knew without discussing it that no one was going for big objectives anytime soon. “Is this all you got? !” He yelled into the snowy abyss. I stared in awe and disbelief. Over the course of the next few days optimism waned. Three feet of snow became five, then eight. 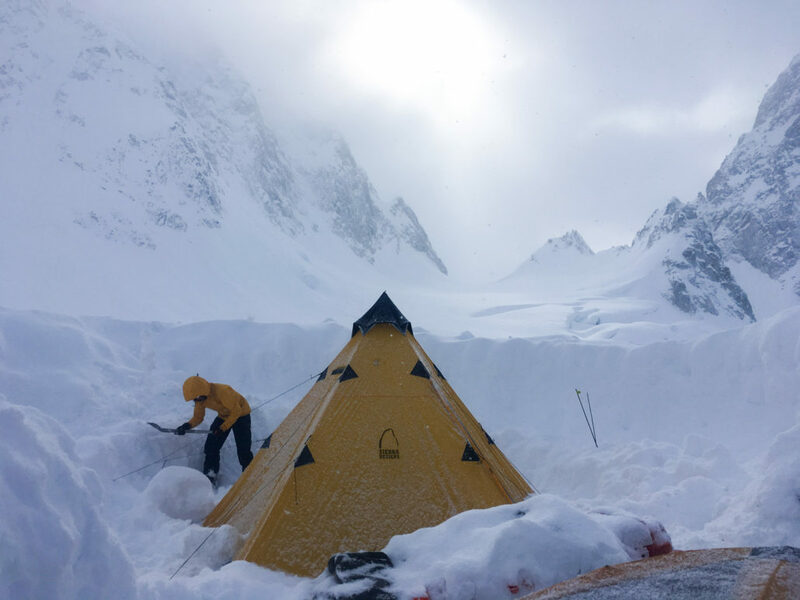 Surrounding camps shrank into the glacier, the tip of a ski or a kitchen tent sometimes visible through the haze of snow. At this point, we were on more of an extreme camping mission than a ski trip, as our only goal was to keep the relentless snow from inundating us entirely. Shoveling, it turns out, is a full time job that demands copious amounts of coffee, gore-tex, and 80s dance tunes. Our kitchen tent pole snapped in half! Cue the Voile Straps. It snowed at least twelve feet, the bulk of it falling in about three days. Our neighbors lost their skis and a tent to an avalanche that struck their camp. Our kitchen tent pole broke in half. Three of us got sick with a brutal cold. 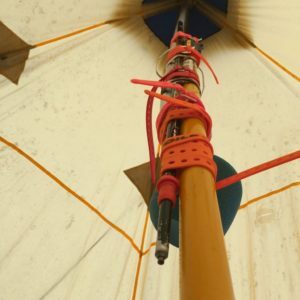 Tents ripped, gloves froze, and airplanes were firmly grounded in Talkeetna for over a week. In that time, no one skied more than a few low-angle turns (but man, were they deep!). Still, I regret nothing. There’s a masochistic joy in both the monotony and camaraderie of endless shoveling that is impossible to replicate in less challenging situations. In a range so notoriously inhospitable, success is measured by our ability to show up and stay the course with a sense of humor and humility, regardless of outcome. 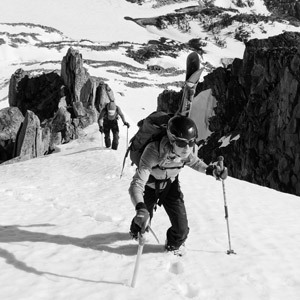 Skiing, especially in this environment, is an activity that rewards patience, sound judgment, and commitment. 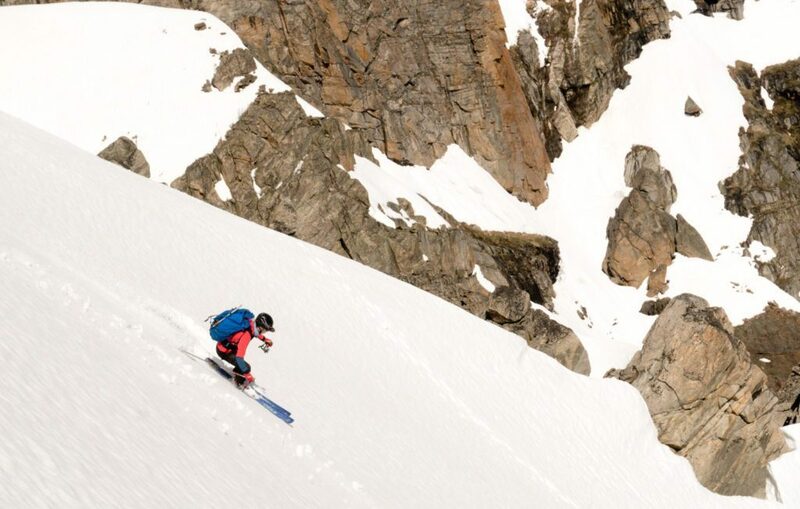 It’s difficult to be a half-hearted backcountry skier and see any reward, because some of the best moments we have in the mountains are born from scouting missions and failed attempts. If we’re lucky, the friendships we form and lessons we learn in the mountains spill into the minutiae of daily life. In addition to being an aspiring big mountain athlete, Hannah is an artist who draws her inspiration from mountain landscapes. 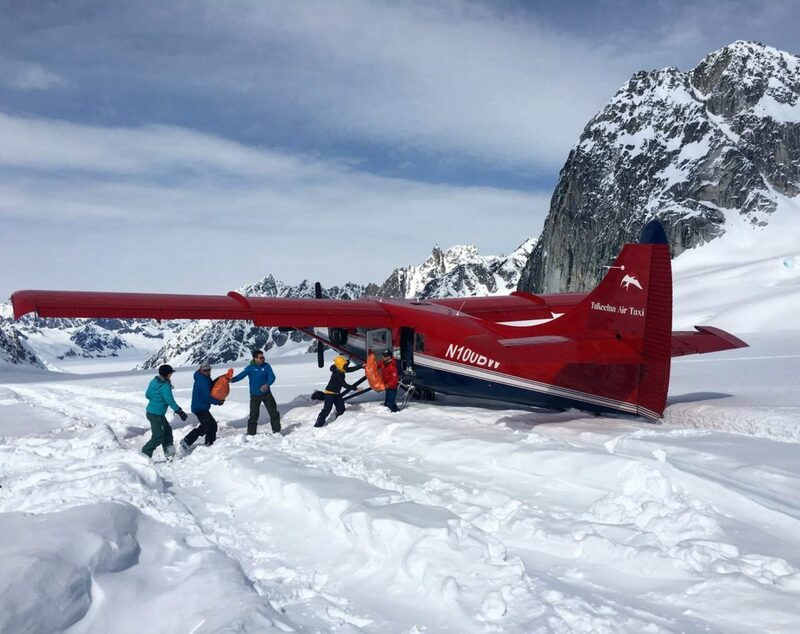 With funding through the American Alpine Club’s Live Your Dream Grant, Hannah and a small group of women flew into the Pika Glacier, a tributary of the Kahiltna Glacier in Denali National Park, to explore ski mountaineering objectives in the area for ten days. 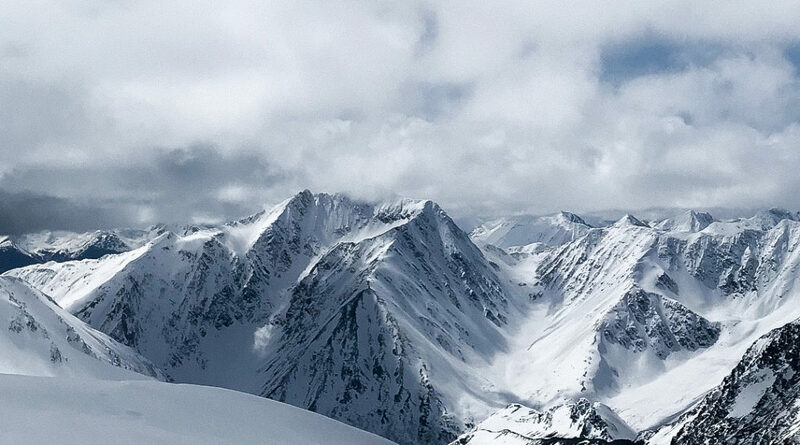 The Pika Glacier is an area known for its alpine climbing objectives, but remains less traveled by skiers. Among her intentions for this expedition was to create watercolor paintings of this remote and rapidly changing backwater glacier in Denali National Park in an effort to draw attention to the disappearing glaciated landscapes of North America.